Sutch was born at New End Hospital, Hampstead, North West London. In the 1960s, inspired by Screamin' Jay Hawkins, he changed his artist name to Screaming Lord Sutch, 3rd Earl of Harrow, despite having no connection with the peerage. His legal name remained David Edward Sutch. Following a career as an early-'60s rock 'n' roll attraction, it became customary for the UK press to refer to him as Screaming Lord Sutch, or simply Lord Sutch. Early works included recordings produced by audio pioneer Joe Meek. During the 1960s, Screaming Lord Sutch was known for his horror-themed stage show, dressing as Jack the Ripper, pre-dating the shock rock antics of Alice Cooper. Accompanied by his band, The Savages, he started by coming out of a black coffin. Other props included knives and daggers, skulls and "bodies". Sutch booked themed tours, such as 'Sutch and the Roman Empire', where Sutch and the band members would be dressed up as Roman soldiers. Despite self-confessed lack of vocal talent, he released horror-themed singles during the early to mid-'60s, the most popular "Jack the Ripper", covered live and on record by garage rock bands including the White Stripes, The Black Lips and The Horrors for their debut album, Strange House. In 1963, Sutch and his manager, Reginald Calvert, took over Shivering Sands Army Fort, a Maunsell Fort off Southend. This was to be Radio Sutch, intending to compete with other pirate radio stations such as Radio Caroline. He planned to play music and broadcast Mandy Rice-Davies reading Lady Chatterley's Lover. It didn't happen and Calvert took over the project, renaming it 'Radio City', which lasted for a couple of years. In 1966 Calvert was shot dead by Oliver Smedley over a financial dispute. Smedley was acquitted on grounds of self-defence. About this time Ritchie Blackmore left the band to form Deep Purple. Roger Warwick left to set up an R&B big band for Freddie Mack. In 1968, Sutch toured parts of the United States in a Rolls Royce with a Union Flag on the roof and a trailer of Marshall amplifiers to sell.He had a share interest in the Marshall company. 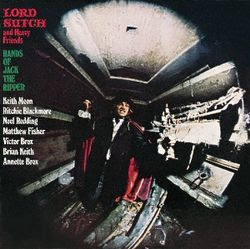 Sutch's album Lord Sutch and Heavy Friends was named in a 1998 BBC poll as the worst album of all time, a status it also held in Colin Larkin's book The Top 1000 Albums of All Time, despite the fact that Jimmy Page, John Bonham, Jeff Beck, Noel Redding and Nicky Hopkinsperformed on it and helped write it. For his follow-up, Hands of Jack the Ripper, Sutch assembled British rock celebrities for a concert at the Carshalton Park Rock 'n' Roll Festival. The show was recorded (though only Sutch knew), and it was released to the surprise of the musicians. Musicians on the record included Ritchie Blackmore (guitar); Matthew Fisher (keyboard); Carlo Little (drums); Keith Moon (drums); Noel Redding (bass) and Nick Simper (bass). In the Rolling Stones song "Get Off of My Cloud", the guy who shows up "All dressed up just like a Union Jack" was Lord Sutch uninvited in Mick Jagger's room. In the 1960s, he stood in parliamentary elections, often as representative of the National Teenage Party. His first was in 1963, when he contested the by-election in Stratford-upon-Avon caused by the resignation of John Profumo. He gained 208 votes. His next was at the 1964 General Election when he stood in Harold Wilson's Huyton constituency. Here he received 518 votes. He founded the Official Monster Raving Loony Party in 1983 and fought the Bermondsey by-election. In his career he contested over 40elections, rarely threatening the major candidates, but often getting a respectable number of votes. He was easily recognisable at election counts due to flamboyant clothes. It was after he polled several hundred votes in Margaret Thatcher's Finchley constituency in 1983 that the deposit paid by candidates was raised from £150 to £500. This did little to deter Sutch, who increased the concerts he performed to pay for campaigns. His most significant contribution to politics came at the Bootle by-election in 1990. He secured more votes than the candidate of the Continuing SDP, led by former Foreign Secretary David Owen. Within days the SDP dissolved itself. In 1993, when the British National Party gained its first local councillor, Derek Beackon, Sutch pointed out that the Official Monster Raving Loony Party already had six. He appeared as himself in the first episode of ITV comedy The New Statesman, coming second in the 1987 election, ahead of the Labour and SDP, which saw Alan B'Stard elected to Parliament. Adverts in the 1990s for Heineken Pilsener boasted that "Only Heineken can do this". One had Sutch at 10 Downing Street after becomingPrime Minister. Despite his antics, Sutch suffered from depression and committed suicide by hanging on 16 June 1999, following the death of his mother the previous year. At the inquest, his fiancée said he had "manic depression". Sutch is survived by a son, Tristan Lord Gwynne Sutch, born in 1975 to the American model Thann Rendessy. In 1991, Sutch's autobiography Life as Sutch: The Official Autobiography of a Raving Looney (written with Peter Chippindale) was published but recalled by publishers. In 2005 Graham Sharpe, who had known Sutch since the late 1960s, wrote the first biography, The Man Who Was Screaming Lord Sutch. Yes, I got it here, than lossless in torrent. Catch it there thou alive.